Zetsurin (絶倫) is loosely translated as "Be Excellent and surpass all others" - quite a bold claim for a $60 sword. 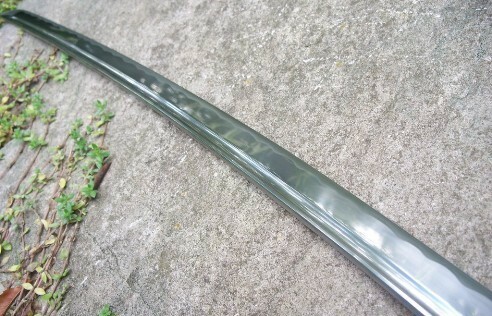 But in terms of sales and popularily, the Zetsurin does quite well for itself - so much so that Musashi have a hard time keeping up production of these swords and they are never in stock for very long. But can this modern interpretations of an ancient Japanese Samurai sword actually make the cut? 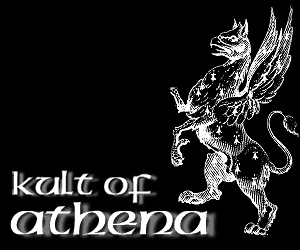 Read on to find out for yourself! Musashi Swords has quite a good reputation on SBG. 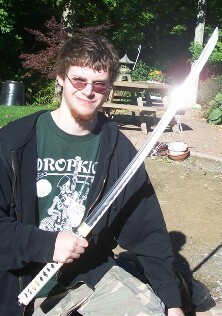 And when I saw the pics of this sword, along with testimony from other members, I decided I had to have one. 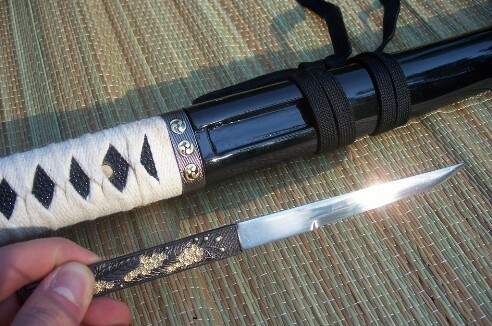 The white Ito and Aikuchi style (no tsuba) was unique, and different from any other sword out there. The box arrived at my door, and I immediately set about releasing the sword from it's cardboard prison. It came in a simple cardboard box with the Musashi Logo on it. Adequate for it's purpose. 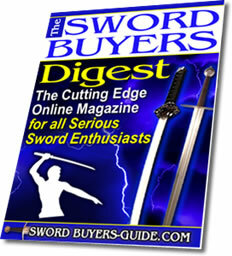 The sword rested on two Styrofoam blocks inside, wrapped in the standard sword bag. I removed it and marveled. It was quite attractive, and very slim. The wrap on the Tsuka was not snow white like it looks in the pictures, but it's still pretty nice. It's quite tight, and evenly spaced. The same is fake black plastic, and looks quite shiny. I don't care for it, but at a sword in this price range, I can't complain. Same goes for the gold plastic menuki. The Koshirae were quite nice, being of a painted zinc alloy. 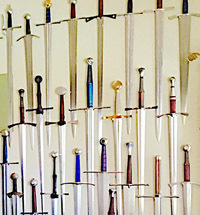 They were quite attractive, and added to the uniqueness of the sword. 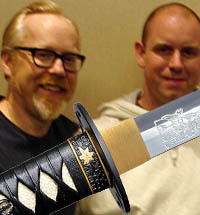 The kozuka was a nice touch, even though it wasn't sharp. It does throw quite well though. 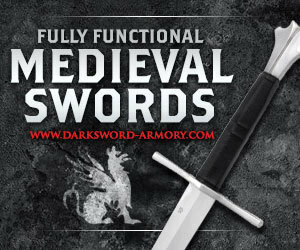 The blade is made out of 1045 carbon steel and is polished to a nice lustre. Not mirror, but close. It's a very nice blade. The hamon is wire brushed, but still looks good. You have to look very close to tell. The bo-hi is even and well done, and I love the way it sounds! Kissaki is very well done, better then either my shura or my Oni forge Kage, which is saying allot considering both cost more then twice as much. 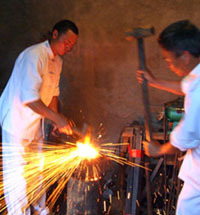 Tang and Tsuka: I removed the tsuka from the tang, which required a padded wooden block to to the lack of tsuba. The friction fit to the tang was very good, but I managed to crack the tsuka when I removed it. I used wood glue to fill it in, and clamped it overnight. It's fine now. 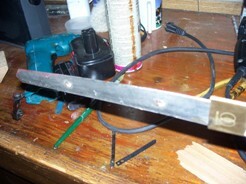 The tang was thinner then I expected, but it was free of rust, and of sufficient size to not bother me. The blade is quite sharp, and carves paper with ease. 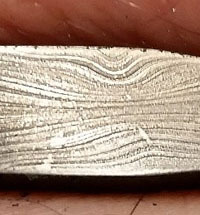 It is evenly sharpened along the whole length, which worries me a little, due to the lack of tsuba. I took it outside to test it, and I swear I could see the water bottles quake in fear. I set up my one remaining milk jug, and my last beach mat. I need more cutting supplies! Enjoy! Please don't laugh, my editing is not l33t, and neither is my technique. It cut through water filled bottles with ease, and the milk jug stood no chance. 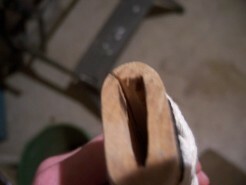 On the last cut of the jug, I accidentally hit the log I was using as a stand, and gouged a small chunk out of the wood. The sword was unharmed, so I continued with a hanging bottle (missed that first stab) and my last beach mat. The sword cut very cleanly in all instance, like a knife through butter. For the price I paid, this sword is golden. It handles like a dream, cuts great, and it looks good doing it. 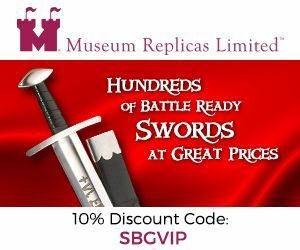 I was drawn to this sword by it's unique look, but it's an excellent cutter as well, rivaling many more expensive swords. It's fake same and menuki bring it down a little but it's acceptable in this price range. The only other concern I have is that the white Ito becomes dirty rather quickly, a problem shared by other owners. My solution to this was to use Sneaker White, a product that whitens tennis shoes. It's cheap, and works quite well. 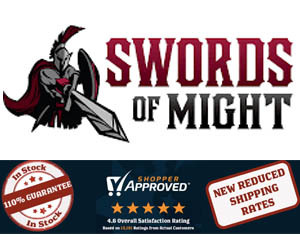 So if your looking for a sword that looks good, and performs way above it's price mark, then this is the one for you. Good for light to medium cutting. Lack of Hand Guard means presents danger to the hand when cutting. Handle with EXTREME care. 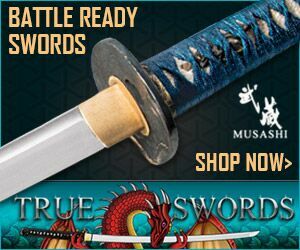 The best place for price on this unusual and mystical looking ancient Japanese samurai sword replica is here at Trueswords.com where they walk out the door for a ridiculously low US$54.99. 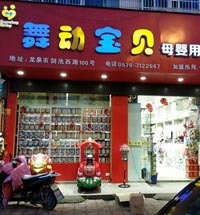 And as demand far exceeds supply, if you like it and see it is in stock, you had better act fast!